Any successful trader will tell you that an integral part of a working and profitable trading system is a trading plan. A trading plan is a set of precise rules which help you achieve your goals. Goals are a main indicator for seeing if your trading plan works and if you follow your trading plan accordingly, which is why it is important to keep track of. We’re proud to introduce another unique and powerful feature available only to Myfxbook users – Goals – an automated, real time way of tracking your goals progress over different time frames. Goals will allow you to track 14 different goal types across 4 different time frames (daily, weekly, monthly and yearly). Moreover, you can browse through the different periods across different time frames to see which goals met, which isn’t, and if you improve over time in achieving all of your goals. Goals are powerful not only for you but also for your followers – they can see if you’re reaching your goals as a trader or not. The Goals feature is private by default, however in case you wish to share it with others, you can do so by setting it to public (in the privacy settings of your account). 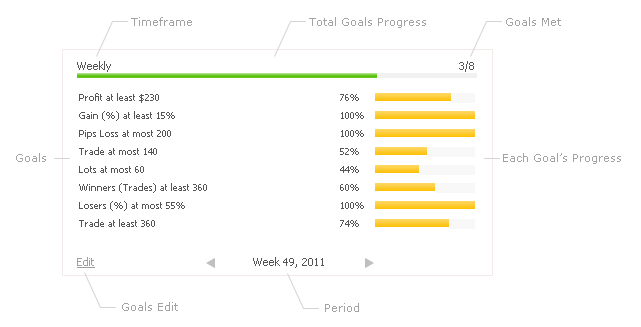 The Goals tab can be found in the new ‘trading’ section (which also includes now periods), just below your chart. Another addition is the share button which replaces the ‘report a bug’ button – you can now share each page on facebook and twitter, view the system’s url and invitation (not to worry, the bug report button is moved to the bottom menu :)). 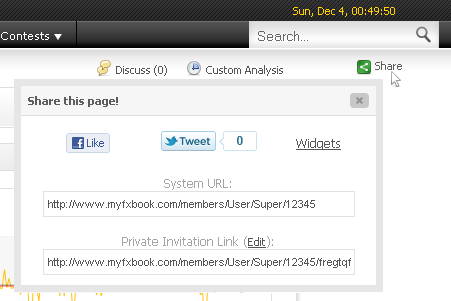 You are currently browsing the The Myfxbook Blog blog archives for December, 2011.